Following their triumphant SmackDown Live Tag Team Championship win over The Usos last week, one half of The Hardy Boyz, Matt Hardy, was asked on Twitter which tag team he and his brother Jeff would like to defend their straps against. Interestingly enough, Matt revealed a long list of tag teams on Twitter. At WrestleMania 35, former SmackDown Live Tag Team Champions, The Usos successfully defended their Tag Team Titles in a Fatal Four-Way match featuring The Bar, Rusev & Shinsuke Nakamura, and Aleister Black & Ricochet. Having won the titles at the Elimination Chamber pay-per-view, this was The Usos' big title defence at The Grandest Stage of Them All. However, following their emphatic win, the very next night on SmackDown Live, Jimmy and Jey ended up losing their title belts to The Hardy Boyz. Matt and Jeff Hardy have pretty much held every single Tag Team Championship belt the WWE had to offer them, and with the duo now into their first reign as SmackDown Live Tag Team Champions, they are more than willing to prove themselves and the WWE Universe that they are fighting champions. 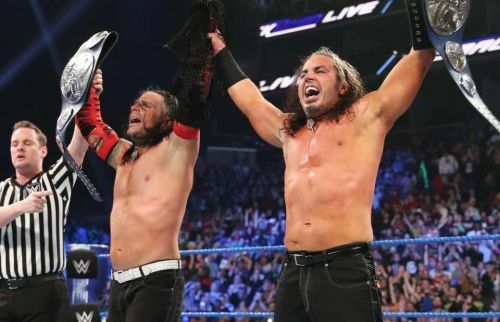 When recently asked on Twitter which tag team The Hardy Boyz would like to go up against in order to defend their SmackDown Live Tag Team Titles, Matt Hardy responded by naming the likes of The Usos, The Club, The Revival, The New Day, and Black & Ricochet as well. This very well proves that The Hardy Boyz are indeed going to be fighting champions and are willing to provide us with several dream matches. The Hardy Boyz are currently in their first reign as SmackDown Live Tag Team Champions, and expect both Matt and Jeff to put their straps on the line against some of the best tag teams the WWE currently has to offer. And with the Superstar Shake-Up set to take place on SmackDown Live tomorrow, expect some new tag teams to jump ship to the blue brand as well.